Have you been searching high and low for the perfect towel for your salon? Perhaps you've investigated various dimensions and colors in an attempt to select the best style for your business. If you haven't found the perfect solution for your drying accessories needs, though, worry no more — Towel Super Center has you covered! Our wholesale hunter green microfiber towels provide any salon with the added style they need. In a business centered around aesthetics, why not choose a towel that meets your company’s standards? Don’t be surprised if your guests ask where you got your towels. With their vibrant hunter green color, our towels are virtually irresistible. Our microfiber towels boast a poly-blend composition that makes cleaning up spills and messes hassle-free. 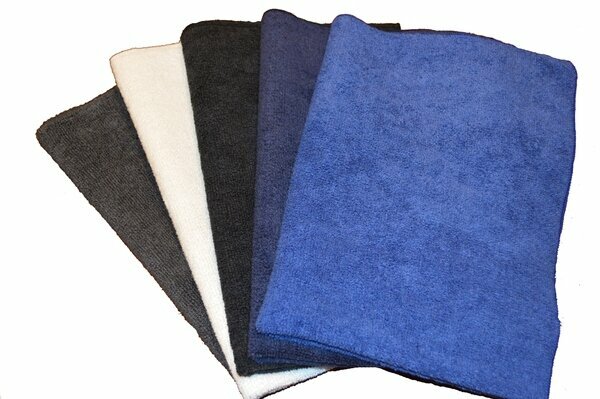 Invest in our wholesale hunter green microfiber towels today to experience the luxury of premium towels for yourself. Green is an earthy color that projects an aura of peace and tranquility. Opt for a pop of green color in your hand towels if you want to add a sense of serenity to your salon. Green is guaranteed to bring warm vibes into your salon without detracting from your preexisting décor or color scheme in the process. For many, green is a color typically associated with the holidays. From Christmas to St. Patrick's Day, green is a prominent color that dominates many of the year's festivities. Add an extra reason to celebrate the holiday season with a towel that is sure to complement the celebratory vibes. Why not take your towels up a notch with a custom logo, monogram or motto embroidered onto each of your hunter green microfiber towels? No other salon will have a towel quite like yours, especially with custom embroidery that sets you apart from the crowd! If you have a particular event with giveaways, there's no better souvenir for your clients than a soft and plush hand towel they can display in their own home. When you embroider your salon's name or logo onto each of your hunter green microfiber towels, your customers will have an enjoyable reminder of the quality experience they had at your upscale salon. When you place your microfiber wholesale order at Towel Super Center, we can send your shipment straight to your embroiderer of choice for added simplicity. Once your towels receive that added touch, you can display them with the added confidence of a personalized towel your guests are guaranteed to love and remember. When it comes to shopping for towels, wholesale is always the way to go. Your salon requires plenty of towels to meet your business's daily demands. Don't settle for subpar materials when you can invest in soft, plush, durable and appealing hunter green microfiber towels instead! At Towel Super Center, we believe putting your best foot forward every single day is important. That’s why we offer customers superior products they can display in their businesses with pride. Call or place your order online today to receive top-of-the-line towels your salon can rely on to perform with style.